LINCOLN, Neb. (AP) -- A proposed Canada-to-Texas oil pipeline would run just 1,000 feet from Terri Funk's doorstep, but the Nebraska farmer and her husband don't plan to protest or even attend the U.S. State Department's lone public hearing on the contentious proposal Thursday. That's because the company building the pipeline has pledged to restore any of their land it digs up. So her opinion is this: Build away. Just months after intense opposition in Nebraska helped delay and reroute the Keystone XL pipeline, Funk's position has grown more popular in this conservative state. Local politicians and landowners now largely support the line — or at least aren't actively opposing it. "I'm not really worried about it," said Funk, who grows corn and soybeans in Antelope County, about 150 miles northwest of Omaha. "It's planting season right now, and we've got better things to do." TransCanada, which is building the pipeline, has told the couple they could continue growing crops and that the disruption of their property would be temporary. The agreement, one of hundreds reached with landowners in the state, gives Funk little reason to drive to the planned eight-hour public hearing about 100 miles away in Grand Island. 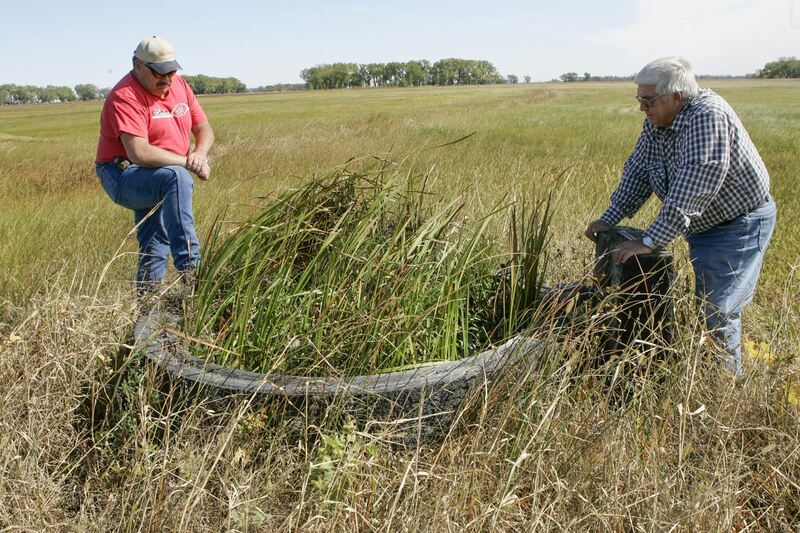 Besides the individual deals with landowners, opinions have shifted in Nebraska since the line was rerouted away from the ecologically sensitive Sandhills region, which overlies the sprawling Ogallala Aquifer. There still will be plenty of opposition voiced Thursday from environmentalists who maintain the pipeline could have catastrophic implications for global warming and still crosses parts of the fragile, sandy soil that is outside the officially designated Sandhills region. But in Nebraska — the most visible face of the opposition effort a year ago — even some opponents now seem resigned to idea that Keystone XL will be built. "I'm not really happy with the way it is, but you can only fight for so long," said Todd Cone, who was a vocal opponent of the initial route that cut through the Sandhills near his property. "It's moved off to the east now. And I guess my thought is, those people over there, they need to stick up for themselves." Supporters and opponents are expected to pack the State Department's only hearing before Secretary John Kerry recommends to President Barack Obama whether to build the $7.6 billion Canada-to-Texas line. A recommendation by the department, which has jurisdiction because the pipeline would cross a U.S. border, is not expected until summer. A poll last year by the Omaha World-Herald showed Nebraskans support the pipeline by more than a 2-to-1 ratio, and the state's governor and congressional delegation — all Republicans — have either backed the plan or relaxed their opposition. That support mirrors national sentiment about the pipeline. A poll last month by the Pew Research Center showed that 66 percent of those polled favor building the pipeline, compared with 23 percent who oppose it. The pipeline would carry 800,000 barrels of oil a day across six states to refineries along the Gulf Coast. One leg of the pipeline from Cushing, Okla., to ports near Houston, already has been approved and construction is proceeding. Jane Kleeb, executive director of the anti-pipeline group Bold Nebraska, said it's wrong to conclude opposition to the project has waned. A core group of Nebraska ranchers, property-rights advocates, young people and American Indians will continue to fight the pipeline, and national and global opposition remains strong, she said. Kleeb's group is among those trying to persuade Obama to reject a federal permit for the pipeline, and opponents also have filed a lawsuit challenging a new Nebraska law that allowed the Department of Environmental Quality to review the new proposed pipeline route. The law is key because it allowed the state to re-launch its review after Obama denied a federal permit for the original pipeline route last year. TransCanada was allowed to reapply once the pipeline through Nebraska was rerouted around the Sandhills. Nebraska remains a battleground for national groups because the opposition originated with local landowners, said Becky Bond, the policy director for the San Francisco-based CREDO Action, the left-leaning advocacy arm of a cell phone company that opposes the pipeline. "What's happening in Nebraska proves that this isn't a red and blue issue," Bond said. "Nebraska proves that this is a common-sense issue about protecting our water and our climate." National opponents have formed a new group, the "All Risk, No Reward Coalition," which recently ran television ads in large markets, including Boston, Denver, Los Angeles and Philadelphia, and planned to air the ads Tuesday in Lincoln, Neb. The ad targets what the group calls TransCanada's poor safety record and highlights a recent oil spill in Arkansas. Opponents say the thick, gooey oil derived from tar sands in western Canada is harder to clean up than conventional oil. The Keystone XL pipeline would carry a similar type of oil. The Sierra Club sent emails to supporters showing video of the Arkansas spill, warning that tar sand pipelines are "disasters waiting to happen." Terry Frisch, a landowner from the north-central Nebraska community of Atkinson, insisted a core group of Nebraska opponents — dubbed "the posse" — remains strong, but he acknowledged some landowners have moved on. Although the line was shifted away from his property, Frisch said he remains ardently opposed because of fears the pipeline could endanger the aquiver. "This has caused some real friendships to go by the wayside," Frisch said. "The only ones who are satisfied with it are the politicians and the ones who are bought off by TransCanada. But this is all we've got. It's all we've got. We're expected to feed the world, and this water is our lifeblood. We won't live without water." Nebraska Gov. Dave Heineman, who opposed the initial route but supported it after the route was changed, said this week he was satisfied the state listened to landowners' concerns. He pointed to a 2,000-page review by the state Department of Environmental Quality that concluded the project would have a minimal environmental impact. TransCanada spokesman Shawn Howard said the company has listened to the concerns of Nebraska residents during a series of state environmental hearings. The company also submitted to four federal environmental reviews and nearly a dozen state and local ones, he said. "The product we carry is essential, and the need for it doesn't change," Howard said. "Would you rather get it from Venezuela, and have to ship it farther, in a way that's less safe? Where do Americans want to get the oil that we all use to power our homes and our vehicles — including the vehicles and airplanes that are going to bring the opponents to this meeting?"